Home Guides How To Get Help In Windows 10 ? How to Get help in Windows 10 is among the most received queries nowadays on our Website. It is common to get these type of queries from Windows 10 users around the world. So in this post, we will provide a free Windows 10 tutorial on getting Windows 10 help. Microsoft released the Microsoft Windows 10 back in 2015. Even after being a regular Windows user I too faced some issues using Windows 10 initially. Windows 10 came with so many attractive features such as Microsoft Edge and centralized control center. Additionally, Windows 10 provide regular and timely Windows 10 update. As a result of new features and new updates, it is a bit confusing for users to operate. Hence, it is important to know how to get Microsoft support related to Windows 10 problems. Let us go through these simple steps on how to get help in Windows 10 in minutes. This is an easy guide to the offline and online solutions to get Windows 10 help. How to get help in Windows 10 using Cortana? Cortana is a new virtual assistant in Windows 10 system. Microsoft Cortana works like Google Assistant for Android users or Siri for iPhone users. Cortana is available with both type or voice search features. How to locate Cortana in Windows 10? You can access Cortana from the bottom left corner of the screen, just next after Windows symbol. To take help from Cortana. Click on the microphone in the menu bar says ‘hey Cortana’. This feature is available after you enable voice search with Cortana in your Windows 10 system. One of the biggest benefits we have in Windows is its ability to answer multiple issues and queries. Cortana can not only solve technical issues but also perform utility functions as well. 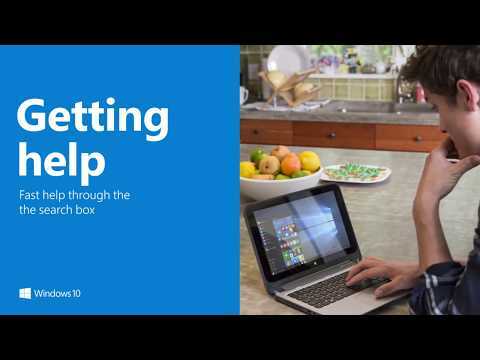 Cortana is one stop solution to your question of “How to Get help in Windows 10?”. Find different settings related to Windows 10. Search required information and files on the system. Monitor flights on different time schedules. Set reminders for places or person. Search websites and do different tasks on the internet. Providing news and weather information. If you do not find your query in above topics. You can just type your query in the search bar. For example, I am trying to locate settings to show ‘Hidden files‘ in Windows. As you can see we can easily locate settings related to ‘Hidden files’ in Windows 10. Just like this, we can locate any file or settings easily using Cortana. What if the query is not answered by Cortana directly? If the solution is not available in Cortana database it takes you web results from Cortana itself. For Example, I tried to locate a ‘shortcut for screenshot in Windows 10’. It Gave us an option to go to Web results. On clicking further we are redirected to Web results. Now we know we need to use the Snipping Tool to take a screenshot in Windows 10. Therefore you can see how easy it is to use Windows to get help in Windows. let us move further to other options. ALSO READ: How To Change Ringtone In Windows 10 Mobile? How to get help in Windows 10 by contacting Microsoft Support? To get official help from Microsoft, we need to perform the following steps. Click on the start button Windows icon. Here you will see some options to get official Microsoft help to get help in Windows 10. Microsoft provides options such as ask question, search for keywords or ask for a particular setting. You can also get online help from Microsoft. There is an option for arranging a call or chat with a Microsoft technical team. It will take you to a new Window in your browser. Now scroll down and click on contact a Microsoft support professional option. Then a new window appears now Click on Getting Started option. Tell Microsoft about your issues, for example, I chose to take help with hidden files. Using this option, a user can arrange to schedule a call with Microsoft tech experts. Interestingly Options to schedule a call for a later time is also present. Along with this, there is another option to chat with tech experts from Microsoft. Microsoft tech support is highly customer friendly and easily accessible. To arrange a call -Click on option number 1 ‘ Arrange a call’. A new window will appear. Here you can fill your calling details and time convenient to you for receiving a call from Microsoft support team. To chat with an IT professional-Click on option number 2. On clicking the Chat option a new chat window will appear. Hence you can discuss your issue with Microsoft technical team professional on chat. Community support is to take help one can take from the open online tech community. The problem you are facing is not unique and may be many people are facing the same issue. Here people post their problems and try to get help from one other or guided by tech experts. There are official Microsoft Windows help forum as well as unofficial blogs and websites. But beware of relying on online information blindly. Always choose an authentic tech blog (like this one) to get help in Windows 10. Use ‘F1’ for Help in Windows10!! F1 key (HELP KEY) is present in the Microsoft Windows system to open help option to users. F1 key help to reach the help section of a program that we are currently using. You can also get help using from the desktop itself. The F1 key will open a window in Bing browser related to general problems in Windows 10. All this along with a list of possible solutions to try upon. You can find so many queries related to Windows 10 with solutions including pictures and videos. Read: Get Help With File Explorer In Windows 10! Today we learned how to get help in Windows 10 using different options. The best option is always according to the choice of a user and his problem with Windows 10. We have multiple options to get help in Windows 10. We can get help using the F1 button.F1 button is generally used to take help in the current programme in use. We can also use Cortana the virtual assistant in Windows. Cortana is capable of helping us to get Windows 10 help. If the problem persists further we can take help from Microsoft support online. Hence, we can conclude to getting help in Windows 10 is very easy. Learning about all these different options will help to solve any future problem you may face with Windows 10. Do like, share and comment on this article in order to help other people like you looking for helpful Windows 10 tutorials. Next articleHow to use Remote Desktop to Connect to a Windows 10 PC ?